Who will win the Pacific Division in 2014? In the first of four posts, I will be previewing each division for all hockey fans ready for the upcoming NHL season. We start with the Pacific division. What stands out is there are three teams that, for better or worse, are in a state of transition (Vancouver, San Jose, Edmonton). The rest are either rebuilding (Calgary), need to rebuild (Anaheim, Phoenix) or are the only established team in the division (Los Angeles). In all, this is a division full of very old teams that had a lot of luck on their side last season, have great special teams play, and could see a lot of change amongst their personnel in the long term. Welp, the Calgary Flames are finally in rebuilding mode after years of having this predicament stare them at the face. The two most important cornerstones of the franchise, Jarome Iginla and Mikka Kiprusoff, are gone and Calgary now has to move on without any backup plan. As much as you can say the farm system should help them out, Calgary’s recent drafting history has been nothing short of disgusting. Since 2007, T.J. Brodie and Mikael Backlund have been the only Flames draft picks that are still on the team and have played over 100 career games. That’s not good enough and that’s why Brian Burke was hired as president of hockey operations. However, it’s not like Burke has been world class at drafting as well. So the key for Calgary is to find a way to get back to the top in the fastest, most efficient, and most Brian Burke way possible. There is no other way to say it. This is easily the worst group of forwards in the NHL. First thing that stands out is that Calgary simply has no choice but to have Sean Monahan and Sven Baertschi as top six forwards. On any other team, these players would start on the third line after spending another year in juniors and then have them climb their way up, but they have to be the heart and soul of Calgary’s core. Players such as Matt Stajan and Jiri Hudler have been overpaid, but considering the Flames are so low under the cap, no one will notice. The key to the season is what Calgary will get in return once they have to trade certain players in their rebuilding process. Three players come to mind in the forward corps and they’re Curtis Glencross, Lee Stempniak and Mike Cammalleri. Both Glencross and Stempniak can join any team as third line skill players with a hint of physicality to their game. The biggest name however is Cammalleri, who is in the last year of a $6 million cap hit and his career that is slowly hitting a downward spiral. After averaging 3.69 shots per game in his breakout 2007 season, Cammalleri only shot 2.15 times per game last year. To make matters worse, Cammalleri has not played more 67 games in a season since 2009. Oh, and he’ll already start the season with a possible hand injury. If you take every factor I just mentioned out of the equation, Cammalleri is Calgary’s biggest trade piece and they have to get something important in return from him. The defensive corps looks a tiny bit more stable as they were able to at least hit league average in shots given up. Mark Giordano is by far (granted, by default) their perfect choice for captain as he garners the most experience in the organization and has one the longest contracts on the team. Dennis Wideman went from being a third line defensive liability in Washington to being Calgary’s go-to power play point-man and being one of their most important penalty killers. T.J. Brodie will certainly be an asset the Flames would love to keep in the long term, but they will need to re-sign him before it is too late. Sadly, that is all the quality defensemen Calgary have in their organization as Tyler Wotherspoon is the only defensive prospect in their top 10, and he’s not considered an elite one by any stretch. Shane O’Brien (along with David Jones) came from Colorado as part of the wasteful Alex Tanguay trade. In goal, it’s a disaster. Though young, Karri Ramo has not played in the NHL since 2009 while Joey McDonald was well below average in his only season as a starter with the Islanders that same season. Considering how poor last season was, the special teams units were actually pretty solid. David Jones will join the second unit of the penalty kill that lacked top minute forwards, while Sean Monahan will hope to replace Jarome Iginla’s production on the 1st power play unit. The penalty kill turned out to be very solid since they gave up the tenth most shots/60. However, the power play had the 8th lowest shots/60 while, yet the 4th best shooting percentage. So expect regression to the mean in the man advantage. Best Case Scenario: If things work out for the Flames, their front office figures out what to do in future drafts as they better produce top prospects en mass and they will pick up good assets at the trade deadline. Something substantial comes out from trading one or some of the veterans and a few players have breakout seasons. Players like T.J. Brodie become bigger names. Worse Case Scenario: Nothing changes. Jay Feaster will be seeing such ire from Flames fans the likes of which the franchise has never seen in their history. Brian Burke will replace him, but it will be more of the same, stuck up and stagnating Calgary for years to come. After three straight playoff appearances, the Phoenix Coyotes went down to earth last season. The offense that has always struggled to score goals continued to do so, while the defense began to slip last season. The most important news that came out is that the franchise finally looks like they are in stable ground as a new ownership group agreed to keep the Coyotes in Glendale until 2028. With that brought more financially stability and GM Don Maloney was not afraid to use it by giving a 4 year, $22 million contract to Mike Ribeiro. There was also various trade winds blowing towards defenseman Keith Yandle’s way, but the most rumored one was turned down due to the huge amount of assets Maloney would like in return. Either way, expect the trade rumors to continue as a lack of heavy activity results in a lack of change to where Phoenix will finish in the standings. Along with Ribeiro, Mikkel Boedker is with the Coyotes after being one of many young restricted free agents having no choice but to re-signing with a bridge contract instead of getting the big pay day of their dreams. His 1.39 shots per game and his lack of top tier scoring show why Phoenix wins their case in signing Boedker to so little. This also shows how little depth Phoenix has along the left wing. This could mean that 2011 2nd Round Pick Lucas Lessio could get some playing time during his first professional season. The strength of the team will definitely be at center at both the NHL and developmental level. It will be fascinating to see if Ribeiro can live up to his contract as his power play points compensated his weaknesses in defense and on the faceoff dot. While Ribeiro, physical brute Martin Hanzal and faceoff specialist Antoine Vermette form the strong nucleus in Glendale, Max Domi will be the star of the future in London, Ontario as debate waged on as to whether or not last summer’s first round pick should get a fair chance to make the roster. Chris Brown will get his chance to make a name for himself on the right side that consists of face of the franchise Shane Doan, Radim Vrbata and David Moss. As much as the blue line did not perform to their capabilities last year, this portion of the Coyotes is easily their strongest. For all the trade rumors on Keith Yandle and the long term injury given to Rusty Klesla during the preseason (let’s not forget the ten game suspension handed to reserve forward Paul Bisonnette for leaving the bench and fighting in response to the hit), Phoenix can easily replace them with prospects Brandon Gormley and David Rundblad. Veterans Derek Morris and Zbynek Michalek lead the stay at home core while Oliver Ekman-Larsson will begin his second contract with expectations to be Phoenix’s next face of the franchise. Mike Smith has been very stable for the Coyotes since his arrival, but he now begins a 6 year, $34 million deal that he will have to live up to until he turns 38. For all the criticisms towards Ribeiro’s contract, one hopes that he continues to perform well on the power play because the Coyotes are going to need it, badly. Their 25th ranked unit was the 3rd worst in shots/60 and their shooting percentage was the 4th worst in the NHL. There can’t be any way to go but up as the rest of the man advantage remains intact. As much as Mike Ribeiro’s arrival received headlines, it has to be stated just as much of how big of a loss Boyd Gordon could be. 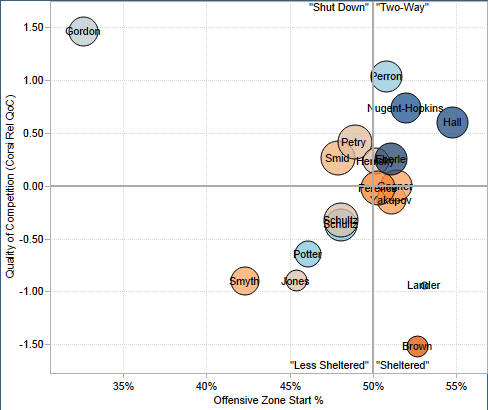 Yes, he was overpaid in the Max Talbot or Joel Ward mold, but Gordon was Phoenix’s leader in shorthanded minutes. The rest of the unit returns otherwise. Best Case Scenario: Phoenix’s ownership group will help the Coyotes feel relaxed and will help them play with a chip on their shoulder. The offense finds a way to score more than they should and Chris Brown becomes a fan favorite during his debut season. Keith Yandle does not get traded and him, Ekman-Larsson and Mike Smith finish with All-Star seasons. Worse Case Scenario: Mike Ribeiro begins to show his age at 34 years old, along with Shane Doan. The prospects are not ready for the show and Keith Yandle has to be traded. Mikkel Boedker continues to not impress management and the lack of depth on the left hand side shows rears ugly head. In 2010, Bruce Boudreau coached the luckiest team in the NHL. In 2013, he almost did it again. Almost all of Anaheim’s numbers looked very inflated last season as the team was near the bottom in Corsi, yet near the top in PDO. Both Ryan Getzlaf and Corey Perry are starting their brand new 8-year contracts while Teemu Selanne will be having one last hurrah at the tender age of 42 and Saku Koivu also returns at age 39. The major news story from the Ducks’ offseason, of course, was the Bobby Ryan trade. After many seasons of waiting, Ryan was finally let go in exchange for Jakub Silfverberg, prospect Steffan Noesen and Ottawa’s 2014 1st round pick. Silfverberg is no slouch of an asset, but his only season in the league isn’t enough for media members to stop asking questions about his potential. Along with questions concerning Perry, Getzlaf, Selanne and Silfverberg, Dustin Penner will also be another talking point amongst Anaheim’s group of forwards. In Los Angeles, he was their whipping boy as he did not live up to expectations despite winning his 2nd Stanley Cup with them. Now he returns to the team where he won his first. As much as Silfverberg will be scrutinized, he did hold his own as a top six forward for Ottawa last year. Like the usage chart states above, his advanced stats also show, like a sore thumb, how differently all of Anaheim’s forwards performed and were utilized compared to the rest of the league. This is a group that will have to stay intact this season as there is little depth from the farm system. Andrew Cogliano could have a huge season at age 26 and at a contract year, as he has never missed an NHL game during his entire career. Penner, Koivu, Daniel Winnik and Nick Bonino are also facing the last year of their contracts and are hoping to impress for a big pay day. Anaheim’s group of defensemen are more stable, contract wise, but this is a very thin group in terms of talent and depth. It is not a secret that I believe you should ever be a cup contender with Sheldon Souray and Francois Beauchemin as your top blue liners, but it is shocking how much they are relied upon on even strength and special teams. Now, Souray will be out for six months with a wrist injury. Expect puck mover Sami Vatanen and former Edmonton Oiler Mark Fistric to carry the minutes lost. This also means that the three year wait for Cam Fowler to live up to his potential has to be over. Yes, it takes longer for defenseman to develop, but Fowler has had high expectations since being a member of the 2010 World Junior Championship team with team USA. Ben Lovejoy will also be counted upon during his first full NHL season…at age 30. 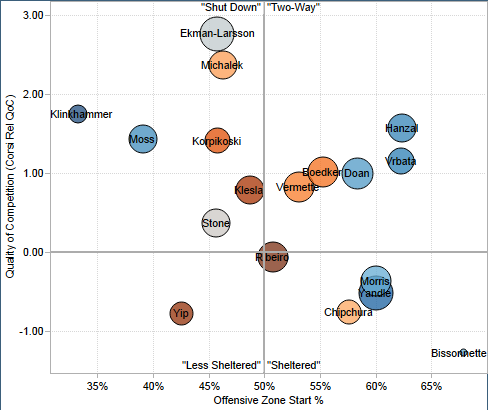 Despite this, Jonas Hiller and Victor Fasth were tremendous last year and hope to steady the ship again this year. Despite their poor displays at 5-on-5 from advanced stats standpoint, Anaheim’s special teams were fantastic. As stated above, however, Souray’s injury can really cripple both units as he was among the top three most reliable defenseman in terms of playing time. Again, it will be up to Cam Fowler to prove that he can silence the critics. On the power play, the Ducks finished 3rd in shots/60 as Silfverberg hopes to replace the Ryan’s minutes on the unit. Outside of Souray, the penalty kill unit remains intact that finished 9th overall despite being the 7th worst team in 4-on-5 save percentage. Best Case Scenario: Not only does Cam Fowler silence the critics, but so does Corey Perry with only his second 90-point season. Jakub Silfverberg and many other forwards will have a fine season and “My name is Jonas” Hiller could receive some Vezina Trophy buzz. Worse Case Scenario: Selanne and Koivu age miserably together and the lack of blue line talent will be talking point all season. Ducks management will rue the day when they had no choice but to give up on prized goalie prospect John Gibson for a veteran defenseman years later. 2014 will be one of the most important seasons in recent Oilers history as Edmonton hopes to make their first playoff appearance since their 2006 Stanley Cup Finals run. Edmonton’s front office are hoping that would be the case by firing Steve Tambellini and replacing him with Oiler lifer Craig McTavish. Dallas Eakins comes in as head coach replacing the fired Ralph Krueger. Unlike years past, this years team consists of young up-and-coming superstars and veterans that can help fulfill key roles. Those specific veterans could be Andrew Ference, David Perron and Boyd Gordon as they were all picked up during the offseason. Perron will be expected to add more scoring depth along the second line while Boyd Gordon and Andrew Ference will hope to add more grit to a defense that gave up the 2nd most shots at even strength in the NHL. Recently resigned Ryan Nugent-Hopkins will also hope to have a major year despite possibly missing the start of the season from offseason shoulder surgery. As great as it is to see such young talent (four of them being two honorable mentions, the 40th and 24th best trade values), two have them have already had to deal with injuries in their young careers. Along with Nugent-Hopkins, Taylor Hall will have to prove that he can play as close to 82 games as possible as his over aggressive style has lead to him being in bad spots. He, is after all, the recipient of one of the most jaw dropping stitches in recent memory. All eyes will also be on Nail Yakupo, as has the potential to hit 30 goals and be a key asset to Russia’s hopes of winning Olympic Gold. Sam Gagner and Nugent-Hopkins will hope that Boyd Gordon can teach them a thing or two about winning faceoffs as they only won an embarrasing 43.9% and 41.0% respectively last year. With the addition of Gordon, expectations will now be put upon the bottom six forwards to fulfill their roles. If players such as Ales Hemsky and Ryan Smith can’t live up to them, then they might have to be traded at the deadline and have someone else come in and fulfill those duties. The blueline will certainly face the most scrutiny this season as they hope the additions of Andrew Ference and KHL veteran Antony Belov can improve their unit. While Ference brings playoff experience (he has the most career playoff games on the team with 120), Belov will hope to bring additional help to the offensive rush so that Justin Schultz does not have to do it on his own. There is plenty of grit on the rest of the defensive unit as Ladislav Smid, Nick Schultz and Jeff Petry are among the leaders on the team in blocked shots and hits last year. Devan Dubnyk had a good 2013, but he will have to prove that he can keep up the same production as he is in the middle of a contract year. Despite both units finishing in the top ten in the league, both power play and penalty kill units had very high shooting and save percentages, respectively. This is despite the fact that the power play was 2nd to last in shots/60 and the penalty kill faced the 6th least amount of shots/60. Either there are some accurate shooting and great goaltending on this team or there is some regression to be had. Gordon’s presence will hopefully keep the penalty kill at an elite level as the same could be said with Belov being on the second unit of the power play. Best Case Scenario: The Oilers become the hottest ticket in town as they make the playoffs. Dallas Eakins wins the Jack Adams award and Devan Dubnyk is another Oiler that will receive $6 million a year contract extension. Justin Schultz also becomes a candidate for the Norris Trophy. Worse Case Scenario: Injuries stunt the growth of many of the star players. Gagner and Nugent-Hopkins will once again be among the five to ten worst faceoff men in hockey. Ryan Smith and Ales Hemsky leave Edmonton with nothing in return and Edmonton will have to go to the free agent market to find their franchise goalie after missing the playoffs once again. It is said that age and experience can help you win a Stanley Cup. However, too much of it could lead you realizing that you need to rebuild. The San Jose Sharks are stuck in the middle of that as they are looking for one more cup run while Patrick Marleau, Joe Thornton and Dan Boyle are on the last year of their contracts. All three players are over 34 years old and carry 365 of those 1171 playoff games the Sharks have as a team. Meanwhile, Logan Couture and Joe Pavelski both received $6 million per year contract extensions. Only Tyler Kennedy was added to a roster with a lot of reputations but dwindling production. Even so, expectations should still be high on this years team. Despite their flaws, this is still a very talented group of forwards, especially at center with Couture, Thornton and Pavelski. The key to this group will be how much production will come out of Joe Thornton. He is still one of the best on the faceoff dot, but his shooting percentage hit the lowest in his career and he didn’t average over nineteen minutes of playing time for the first time since his 2nd year in the league (his age-19 season). 2012 first round pick Tomas Hertl will hope to come in and add some additional goal scoring to a team that was dreadful on the wing last year and lost an out of form Ryan Clowe at last year’s trade deadline. 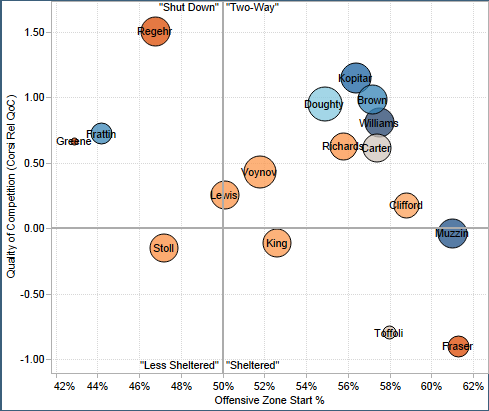 The depth was so bad that heavy hitter Raffi Torres had to play on the second line. Other players that need to step up are Tommy Wingels, who, despite leading the team in hits, will need to improve his scoring and his corsi. If not, recent addition Kennedy will have to take over after a season in which he fell out of favor in Pittsburgh. 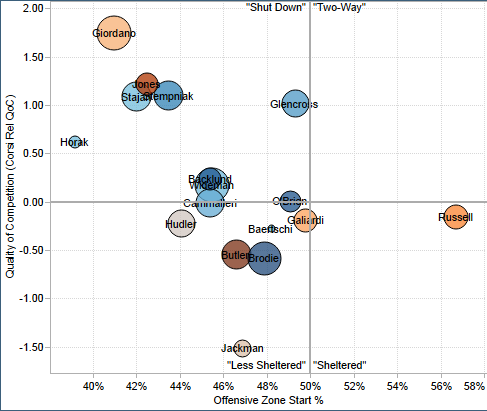 Brent Burns will hope to continue his success at moving from defenseman to right wing. San Jose’s defense also carries plenty of experience with them. There are small weaknesses on this unit, but there is also little to no fanfare. If anything, the one weakness could be the lack of an additional elite puck mover to go along with Dan Boyle. Matt Irwin has looked to be that guy, but this will only be his 2nd full NHL season. 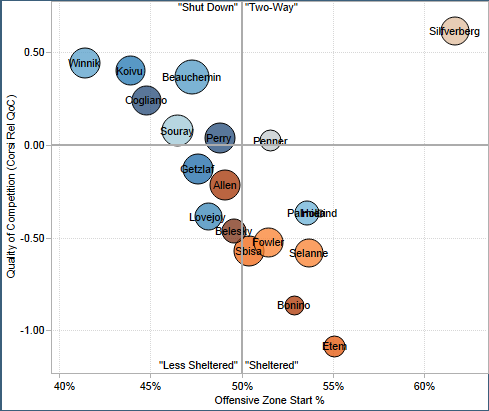 Brad Stuart is the grittiest of the six defensemen, but that’s not a good thing if he is not playing top four minutes. Marc-Edouard Vlasic is certainly a great stay at home defenseman, but he is carrying the load of his partner, Justin Braun, who doesn’t seem to have a standout skill. Scott Hannan is heading to the last year of his contract and, frankly, the last year of his NHL career. Antti Niemi is certainly the most underrated goaltender in hockey (and the 38th best trade value) and absolutely deserved his Vezina buzz from last year. One thing that could be fascinating to watch is how good San Jose’s power play should have been. While finishing tied for 7th overall, the Sharks were easily #1 in shots/60, but had the 9th worst shooting percentage. Tyler Kennedy will come in to a penalty kill unit that was in the top ten in all important categories. Best Case Scenario: San Jose actually wins the Stanley Cup. No, really, this could happen!!! They have enough grit on this team, and players like Hertl, Couture, Burns and Pavelski will drive the offense and San Jose has one of the most staunch defenses and goaltending in hockey. Worse Case Scenario: The Sharks age terribly together. There is too much grit and not enough skill on this team to win hockey games and they will need to find at least one top six forwards and a goal-scoring defenseman at the trade deadline. Otherwise, Thornton, Marleau and Boyle do not re-sign and San Jose will hit year one of many in their rebuilding process. After the Canucks were swept in first round last year (two years after making it to game seven of the Stanley Cup finals), GM Mike Gillis decided it was time to make a change behind the bench. An unintentional coaching swap with the New York Rangers occured as Alain Vigneault is replaced with John Tortorella. For all the burned bridges “Torts” has made over the years, he has a successful track record at getting the best out of little talent and developing young players. Vancouver will need that as little was lost from a team that began to wear down due to age and injuries. If anything, the biggest addition (outside of replacing heavy hitter Maxime Lapierre with Brad Richardson) is the return of Ryan Kesler who was among the best two-way forwards from 2010-2011. Another major storyline for the Canucks this season will be whether or not Daniel and Henrik Sedin come back after this season. They are both on the last year of their contracts and playing at an elite level, but both are 33 years old. They will, once again, team up with another 33 year old in Alex Burrows. Along with the return of Ryan Kesler, David Booth’s return from injury will be a major factor that will drive Vancouver’s offense. Other than that, there are very little options as to who can play at a top six level. Jordan Schroeder needs to have a great season and he will arguably be the biggest project John Tortorella has on his hands. Zach Kassian is another player that is also hoping to break out this season, but he will need to prove that he is more than a guy that delivers big hits as he had one of the worst corsis on the team. 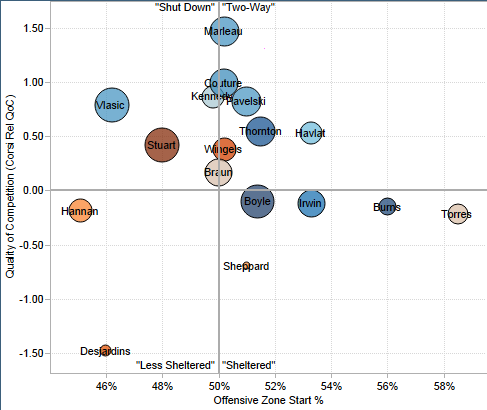 As you can see on the usage chart, there really are a lack of true two-way players on this team and Tortorella hopes to add a defensive mentality to those that need it (hello Chris Higgins and Dale Weise). For an offense that was finding it’s way last season, the defense and goaltending had to be fantastic last year, and it was. Alex Edler, Jason Garrison and Dan Hamhuis had terrific seasons and have lived up to their contracts while the rest were pretty mediocre. Alberts was so bad, that the only way he could continue to play regularly in the NHL was to resign on a veterans minimum one-year deal. Chris Tanev definitely had some growing pains in his first full NHL season, but he definitely has shown signs to be a solid stay at home player. For all the criticism Roberto Luongo has received in the last three to four years, I truly believe it has been overblown. It is not like he has had bad regular seasons and, for now, that’s all Vancouver wants from him. That should be a very simple task for Luongo to achieve and the playoffs should take care of themselves. The power play could not have been worse last year. The unit as a whole was below 16%, and shot the 9th least per 60 minutes in the league. Losing the likes of Ryan Kessler and David Booth really exposed the lack of scoring talent the Canucks had last year that even Derek Roy couldn’t solve it on his own. On the other hand, the penalty kill could be even better than their 6th overall unit last year as they gave up the 6th fewest shots/60 without Kessler. Best Case Scenario: Jordan Schroeder is the biggest beneficiary of John Tortorella’s coaching and he finishes with a 40-50 point season. Zach Kassian finds his niche and the Sedin twins resign until the end of their careers. Oh, and all is forgiven between Roberto Luongo and Canucks fans and media. Worse Case Scenario: Oh boy!!! Robert Luongo has another meltdown during the playoffs as the Canucks get swept by the Sharks in round one all over again. The Sedins sees no light at the end of this tunnel and become the biggest free agents this offseason. As a result, Vancouver begins year one of their rebuild. 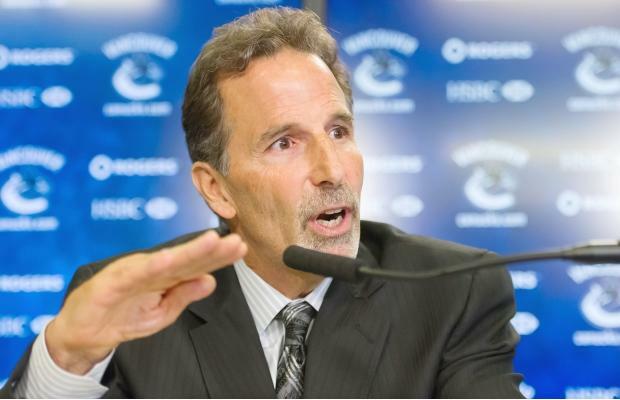 John Tortorella gets fired after one season and will have a successful career replacing Barry Melrose at ESPN. After winning the Stanley Cup in 2012, the Los Angeles Kings backed it up by making it to game six of the Western Conference finals last year. There was no shame in that whatsoever as they lost to the eventual Stanley Cup Champion Chicago Blackhawks. During the regular season, this was a team trying to recharge their batteries at another cup run. Jonathan Quick was not the same player, but he was dealing with a hip injury all of last season. The team’s PDO suffered as a result as they were among the unluckiest teams in the league. That luck certainly turned around at the right time. Now the team is back and mostly intact for the exceptions of Dan Carcillo and Matt Frattin. Just like the last year and a half, Los Angeles’ forward line is about as set as you can get. If there are any concerns, it will be the production of their second line. Both Jeff Carter and Mike Richards have not been shooting the puck as much as they used to and may either team up with not-so-talented Matt Frattin or rookie Tyler Toffoli. Toffoli has what it takes to perform like a top six forward as he scored 51 points in 58 games at the AHL last year. If Toffoli can’t do it, fellow prospects Linden Vey and Tanner Pearson could while they ply their trade with the Monarchs. Otherwise, this is as stable a forward line as you will see in the division. Dustin Brown will be the captain of the Kings for a long time by resigning to max contract worth $55 million. The defensive corps has some questions that need to be answered in order for them to make it back to the Cup finals. The most obvious will be what kind of production will they get out of Willie Mitchell after missing all of last season with a knee injury. If he is not salvageable at age 37, Alec Martinez is a fine replacement with Keaton Ellerby and Jeff Schultz as cover. More will be expected for Robyn Reghyr if he still wants to play top four minutes, let alone be Drew Doughty’s defensive partner. If things go right, breakout years can not only happen for Jake Muzzin, but especially Slava Voynov. Voynov should have been a player to mention in my trade value columns but his corsi relative was in the negative last year and he hasn’t played against tough competition yet. With more playing time, that should change. 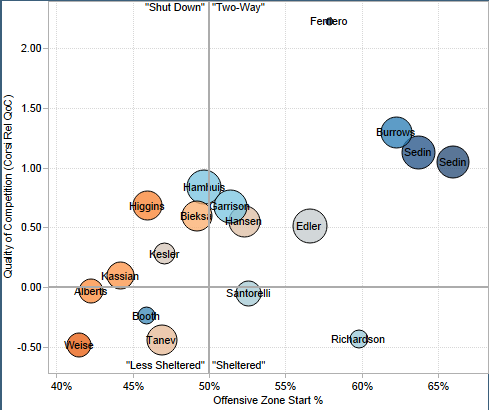 Like Jonathan Bernier last year, it will be fascinating what role Ben Scrivens will have backing up Quick. Best Case Scenario: The Kings will win only their 2nd regular season division title in franchise history (the first since 1990-91) and will play in the Stanley Cup finals. Slava Voynov and Drew Doughty become the best offensive defensemen duo in hockey and the Kings rebound in a major way. Anze Kopitar also attempts to hit 90 points for the first time in his career. Worse Case Scenario: Jonathan Quick picks another injury and Kings fans question why they re-signed him to a ten year deal. Willie Mitchell’s absence and Reghyr’s incompetence results in major shuffling amongst the defensemen and a possible acquisition at the trade deadine. ← How should we calculate expected points in the NHL?